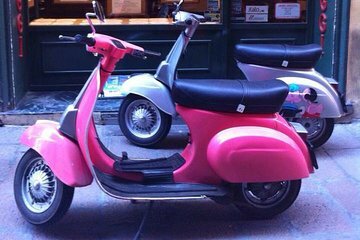 Rent your own Vespa in Bologna to explore its historical streets and neighborhoods at your leisure. This one-day rental of a vintage Vespa gives you the freedom to cruise around town just like a local Italian, checking out Bologna sights like its arcades, university (considered the oldest in the world), restaurants and the medieval town center. You'll feel just like a local! We absolutely loved this tour! Alessandra and Paola who run the rental agency are the best! Not only are they friendly and professional, but they took the time to map out an entire route for us in the Bologna countryside and made suggestions as to wonderful sightseeing spots and a great eatery up in the mountains that we totally enjoyed.